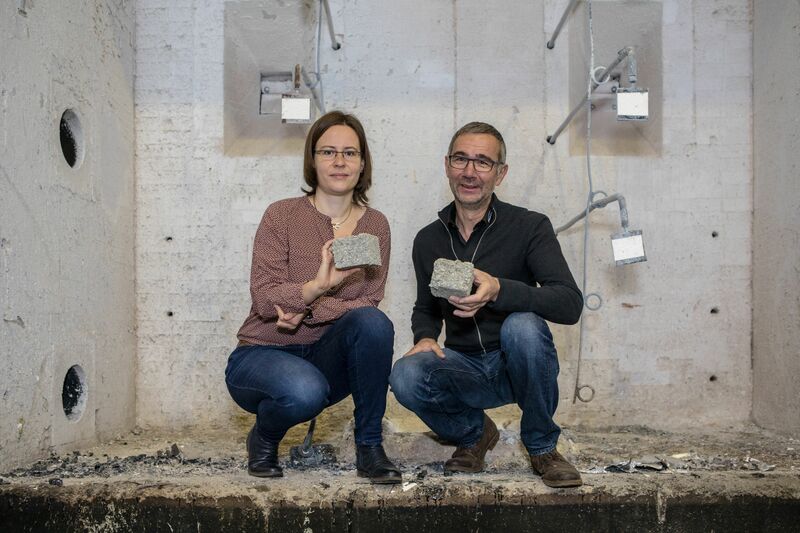 Dübendorf, St. Gallen und Thun, 22.01.2019 - Scientists at Empa teamed up with isofloc AG to develop an insulating material made of recycled paper. It is ideal for prefabricated wooden elements and even multistory timber houses, and protects the construction against fire. What's more: The additive it contains is harmless to humans, animals and the environment. Franziska Grüneberger looks contented; clutching a nondescript cube made of grey flakes in her hand the researcher in the laborato-ry for applied wood materials has achieved her goal: Very little chemistry went into the cube, but no shortage of technical expertise. The tiny object is “living” proof that giant mountains of waste paper can be transformed into a valuable, fireproof insulating material – a big step to save fossil fuels. Not that anyone could tell just by looking at it. The secret lies in what the recycled paper fiber cube doesn’t do: crumble. This very property is important to offer long-term pro-tection against fire for load-bearing elements on timber houses. Precisely this firmness, however, is hard to achieve in the industrial production of insulating layers. “We’re not dealing with insulating mats here, which workers have to cut to size and shape and slot into the components,” explains Grüneberger. “Instead, the recycled paper fibers are automatically blown into a cavity until it is filled completely.” For reasons of cost, this blowing has to take place as easily and as fast as possible, which is why the fibers need to flow well at this point. As soon as they are in the cavity, however, they should keep their shape to protect the construction in case of a fire. Ultimately, the machine-blown insulation should be hard and fill the form in the component like an insulating panel fitted by hand. Only in this way can they stave off the heat of a fire for long enough and prevent the construction from burning down too fast. This is no mean feat: “We had to search for a virtually magical binder for the isofloc cellulose fibers that are already established on the market – a material that ideally works from one second to the next,” says Grüneberger. She clicks her fingers like a magician; all that’s missing is a mumbled «abracadabra». A tour de force of chemistry The project in collaboration with isofloc, a manufacturer of insulation materials, began in the spring of 2017. Franziska Grüneberger and her colleague Thomas Geiger started looking for suitable binding agents – a tour de force of chemistry, as soon became apparent. After all, only those who venture confidently into this terrain will strike gold. The first constraint: For use in sustainable timber construction, the binding agent must be non-toxic – a substance that can come into contact with humans permanently without causing any problems. Auxiliary materials from the textile, paper, cosmetics and food industry – or substances from nature – make strong candidates. The second constraint: the desired binding agent needs to be affordable and available in abundance. “Together with Willi Senn, isofloc›s development engineer, we launched a series of experiments and combined the insulating fibers with different additives,” recalls Grüneberger. In parallel, they searched for the right “starter’s gun” to bind the fibers within the blink of an eye. Heating with steam? With infrared radiation? Using magnetic induction? At long last, they found the coveted material from a long string of “suspects”: a substance from the food industry. Lab experiments at Empa and isofloc in Bütschwil also displayed a reliable bond between the cellulose flake structure during a fire. Upscaling and fire test But does this also work on a large scale? An upscaling test furnished the evidence: The flakes were blown into several wooden frames, alongside an identical cavity with flakes without the novel additive, and fitted using the customary technique. Now it was time to head to the fire lab at VKF ZIP AG, where the wooden frames were exposed to flames at temperatures of 800 to 1,000 degrees for an hour. The wooden frame was not supposed to burn through at any point, nor should any red-hot flakes fall out. The new insulation material stood the test and protected the construction reliably, while the flakes without the additive fell out of the wooden frame for lack of adhesion. Jon-Anton Schmidt, Head of Application Technology at isofloc AG, explains the advantages: “Fitting the insulating material in loose form saves an enormous amount of time. With the additional advantage of dimensional stability and the associated effectiveness for fire safety, we can achieve protection that is on a par with glued mineral wool mats. This makes this ecological and efficient insulation even more interesting for the construction industry.” New generation of industrial insulating systems The final development step is now taking place at isofloc, where mechanical technicians and engineers have to develop a new generation of blow-in machines from the existing protoypes that meet the repeatability and quality control requirements. The dosage of the binding agent is crucial here. It needs to be adhered to and monitored in narrow tolerances throughout all production steps. By isofloc’s reckoning, the new insulation will hit the market together with the corresponding blow-in machines in around a year’s time. 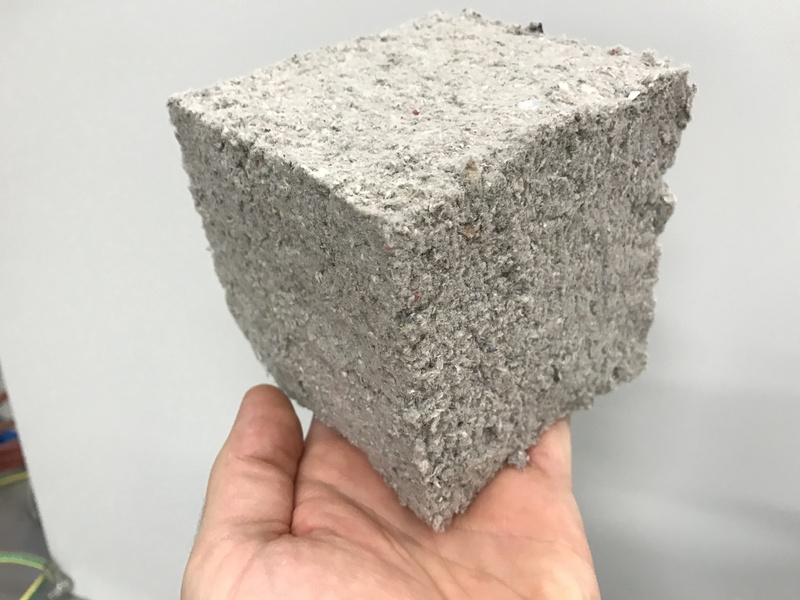 Mountains of waste paper will then be turned into a valuable insulating material that not only helps save vast quantities of fossil fuels during production and use; as the only loose insulating material on the market it can also be used industrially for effective fireproofing.